Product prices and availability are accurate as of 2019-03-31 11:18:09 EDT and are subject to change. Any price and availability information displayed on http://www.amazon.com/ at the time of purchase will apply to the purchase of this product. Sustainably harvested from the fallen leaves of the areca nut palm tree which have been washed, pressed, and sterilized without the use of chemicals, resins or glues or anything else. No binders, no bleach - just the leaf, water, and heat. This simple process creates durable tableware which is 100% completely biodegradable and compostable. 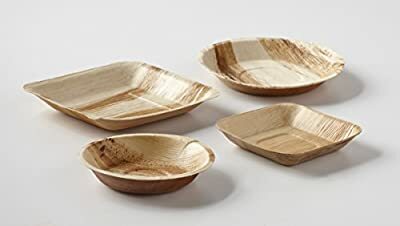 Palm leaf plates vs. paper plates: PAPER PLATES CONTAIN BINDERS, OIL, BLEACH AND WILL NOT COMPOST. PALM LEAF PLATES CONTAIN NO BINDERS AND 100% BIODEGRADABLE AND COMPOSTABLE. Benefits: All natural, 100% biodegradable, Leak proof - CAN HOLD LIQUID FOR 4-6 HOURS, Environmentally friendly, Durable, sturdy and lightweight, microwavable. Harvested from fallen leaves. These plates are molded and steam pressed from the fallen leaves of the Areca nut palm. Why Happy Tiffin Palm Leaf Dinner Plates, 25 Pack? Available in packs of 25 for use on your next picnic, office event, BBQ, tailgating, or any function you want an eco-friendly non-plastic plate. Perfect for reheating in the microwave as the plate is plastic-free and 100% natural. Can be used for any and all occasions such as work, school lunchbox, tailgating, football games, picnics, and road trips. You will find these dinner plates are better than plastic and absolutely safe. BPAfree and toxin-free. Great quality at an affordable price. Why shop Happy Tiffin products? When shopping online, how do you differentiate between so many choices? We have asked the same question, which is why we understand the importance of a trustworthy company. As you continue your product research, take some time to read reviews from some of our satisfied customers who have purchased this product and others like it. In addition to the comments about our products, take note of the way we value our customers. Hopefully it will set us apart from the crowd and make your purchasing decision...Happy.